It was whilst zipping across a frozen lake at 20mph that I realised I’d forgotten a vital item of clothing on our husky trip in Lapland. I’d only brought one pair of gloves and every time I took them off to take a picture of the breathtaking views, my hands felt like they were going to fall off. In temperatures of up to -18, it wasn’t ideal. In my defence, I’d actually brought a thin pair of gloves to go under my thicker ski gloves, I just couldn’t find them before we left for the day. Anyway, lesson learned and I later found them in a side pocket of my hand luggage. 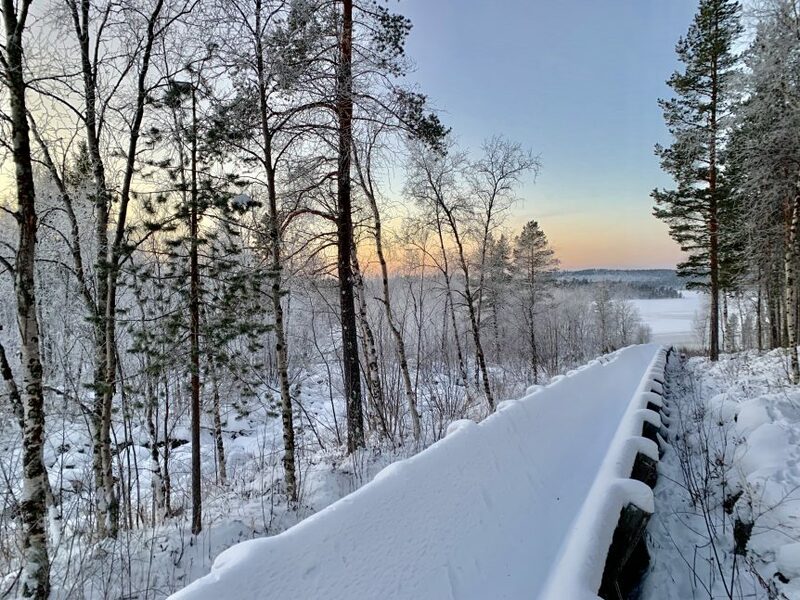 There were several items we took on our Lapland holiday that I would consider essential – many of them specifically for families of children with additional needs. If one or more of your children receives Disability Living Allowance, it’s a good idea to take your award letter(s) with you, particularly if you plan to ask for a sunflower lanyard at the airport. Most airports have adopted the sunflower scheme for people with hidden disabilities. It allows the family to avoid stressful queues and choose whether to board the plane first or last. It made such a difference to our airport experience when we went to Lapland. Big Bear has always struggled with his ears so taking his ear defenders on the plane was really helpful for when we took off. You can also get special flight ear plugs which help ease the pressure. In addition, I took a stash of lollies to help The Bears swallow on take off and landing. If, like me, you have a sensory seeking child, certain toys could help them to cope with the flight and the new holiday environment. I hid some buttons in putty for Big Bear to find on the aeroplane. I also took some flashing spiky balls for the log cabin. Fidget toys like spinners or a magic rainbow ball puzzle might also help divert their attention and provide a few minutes of focus. If I was doing the trip again and could only take one of the items from this list with me, it would be these. They were hands down the best thing we took with us. They are disposable heat packs that you put in your gloves to warm up your hands. However, we used them everywhere: gloves, shoes – even inside our snowsuits. We adopted the advised layering system with clothes but because we weren’t moving around a lot (we spent a fair bit of time riding snow mobiles and sitting on sledges) we did get a bit chilly at times. These little warmers were a lifesaver, they lasted 8 hours and kept us all toasty warm. They did sell them at our hotel but they were hugely expensive so definitely buy them online before you go. We bought 40 pairs for £20 from amazon, although you can buy smaller boxes (not an advert). When you’re travelling at speed in sub-zero temperatures you need to keep your face covered. Either a balaclava or snood/fleece tube scarf that you can pull over your nose and mouth will really help to keep the heat in and stop you feeling like your face is going to break into tiny pieces. If you’ve got children with sensory needs, there is a good chance that going on holiday to a new place with extreme weather will make them feel a bit uneasy. Preparing them in advance helps but reassuring clothing like a compression vest can also be a valuable aid to help them regulate their body, making them feel a bit more secure. The Bears’ hypermobility means they need to use adapted cutlery at mealtimes so I had to remember to bring it with us. I also packed an array of snacks (fruit, biscuits, cereal bars etc) to make sure they didn’t go hungry between meals at the hotel. All our main meals were provided but I didn’t want to have to deal with ravenous children in the middle of nowhere. I also took their water bottles for ease and familiarity. This was something we didn’t actually take but wish we had. They are fairly inexpensive to buy and it would have made capturing some parts of our trip a lot easier, particularly when racing along on a snowmobile or sledging down a hill. Snow boots were actually provided by our hotel but we brought our own for The Bears for peace of mind. Given their extreme hypermobility, I didn’t want to ruin our holiday by taking a chance and ending up with ill-fitting footwear. As I mentioned at the start, a pair of thinner gloves inside a thicker pair will mean you don’t have to expose your bare hands to the freezing elements when you’re trying to take photographs and get things out of your bag. Just remember where you put them! This is probably obvious if you’ve got a child who takes regular medication. However, it’s worth mentioning because it’s definitely an essential. Make sure you’ve got enough to see you through the holiday plus a bit extra in case you’re delayed on the way home. Have I missed anything? What are your essentials for a winter holiday? I’d love to know in the comments below. If you enjoyed Holidays with autism: 11 essential items to pack for a winter holiday, please share this post with your friends and family. Really helpful list here. I hate being cold and might have to look into little hotties. This list is absolutely fantastic for anyone who has children with a disability of any sort. Packing for Lapland is a huge task but even more so when you factor in children with additional needs. Anyone considering Lapland should read this to ensure they get added tips for their packing list. Thank you so much for your lovely comment. I’m hoping our experience will help other people.